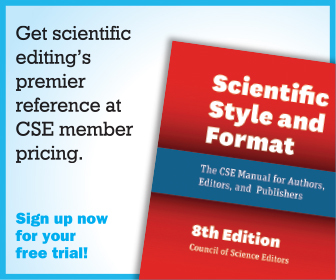 Editors with diverse backgrounds opted to take the Short Course for Manuscript Editors. Attendees’ jobs included editorial assistant, managing editor, and manuscript editor, among others; employers included the United States Department of Agriculture (USDA) Forest Service, the Centers for Disease Control and Prevention (CDC), various journals, universities, and many more. Attendees came from all regions of the United States and Africa to participate in this course. The presenters’ cumulative years in the scholarly publishing industry enabled them to speak to many scenarios and offer targeted advice. The course comprised both broad and specific concepts—from ethical dilemmas to use of shortcuts in Microsoft Word. 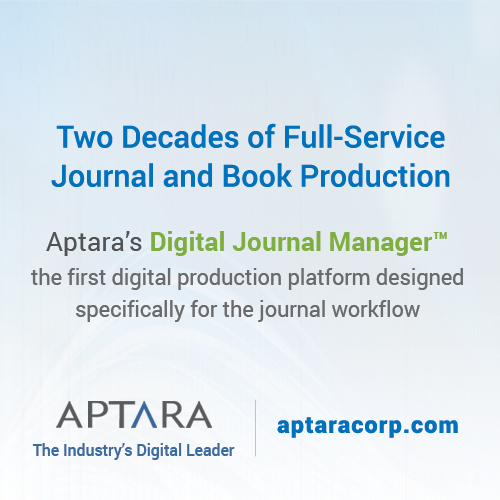 Moreover, it was the perfect opportunity to interface with peers on a smaller scale and learn about how certain organizations handle specific publishing topics. The course started off by highlighting some manuscript editing best practices, for both copyediting and technical processes. Elizabeth Blake explained how Word shortcuts and customizations can help editors achieve higher-quality outcomes. This course focused on the Word 2010 application; however, other versions and the Mac versions were also covered. Throughout her presentation, Blake emphasized how helpful it is to customize Word applications: not only the Quick Access Toolbar and Word Ribbon, but also a majority of the functions of Word can be customized (File → Options is a great place to start). Repair a corrupt Word file using Open and Repair. Change the view to always see fielded text (Options → Advanced → Show Document Content), such as references and citations. Convert text to a table (Insert → Table) and also table to text (Table Tools → Layout). Highlight arbitrary blocks of text, including columns, using the Alt + click combination. View the heading structures within a complex document using Word paragraph styles and the Navigation Pane. Remove formatting from preselected text using the Ctrl + space combination. Apply formatting copied from preselected text using the Format Painter. Return to the last edit in a document, even after closing it and shutting down the computer, using Shift + F5 (also to cycle through the three previous edits in an open document). Using the Split tool (View → Split), data in the abstract and tables can be checked against the data in the results, and image content can be checked alongside figure legends. The Split tool can also be used when checking references to make sure the authors and years match the in-text citations, and to see if the title of the reference is related to the sentence subject. The Find and Replace feature and the Navigation Pane can be used to make local or global text changes to enforce consistency within a document. Jargon and colloquialisms should be avoided; for example, using “significant” when the term “substantial” is more accurate, and describing patients as “diabetic patients” instead of the correct terminology, “patients with diabetes.” These options can be customized in the Writing Style Settings. The Find and Replace (Ctrl + H) feature can help check house style compliance and to review manuscript completeness. Within this feature, the More button offers options to search for special text styles such as superscript or italics by using the Special and Format drop-down menus. Furthermore, Special → Clipboard Contents can be used to replace the Find What text with clipboard contents; this option is useful when replacing text that includes special characters or complex formatting. It is also worth exploring the Wildcard option (e.g., change hyphens to en dashes in all numeric ranges). The newer versions of Word have improved grammar checking features; however, because language can be nuanced, it has not replaced the value of a grammar check by a human editor. Using File → Options → Proofing it is possible to customize the dictionary used by Word and add commonly used terms that are not already in this dictionary, including field-specific terminology, either by adding them one by one or as an entire list from a style guide. It is also possible to incorporate specialized dictionaries (e.g., Dorland’s) for more accurate spell checking. Word now has a “contextual spelling” feature that catches words that are spelled correctly but are incorrect according to the surrounding context. The Word Comments function makes it possible to insert saved boilerplate text for common author queries using AutoCorrect or AutoText. Still, descriptive author queries are necessary to elicit clear answers. The use of Word Options (File → Options) came up throughout Blake’s presentation. In Word Options, it is possible to turn off automatic superscripting of ordinal numbers (such as 1st), text drag-and-drop, and even the Paste Options button that often obscures text. Finally, Blake reminded course participants always to save any customizations when updating to a newer version of Word because they will not carry over automatically. In the next segment of the course, Annette Flanagin discussed several ethical and legal issues relevant to scientific editing. A contentious issue in publishing is authorship and how to differentiate an author from a contributor. 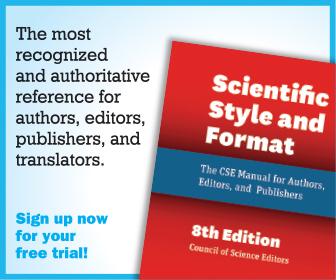 Equally important, journal editors and authors must discern whether authors should be listed in the byline or as collaborators and when it is appropriate for individual authors to be listed as a group author. Flanagin also discussed cases of conflicts of interest, copyright and publication licensing, permissions, and journal policies. According to data published by the US National Library of Medicine, the average number of authors per MEDLINE or PubMed citation has been steadily increasing since 1970 (see https://www.nlm.nih.gov/bsd/authors1.html). Along with the increase in number of authors listed on a paper, there have also been increasing authorship disputes in recent years. Editors must understand policies and criteria for authorship, so they can identify any authorship issues prior to publication. The Committee on Publication Ethics (COPE; publicationethics.org) is a helpful resource for editors; it provides guidelines on how to handle various ethical issues that may surface during the publication process. Another resource, the International Committee of Medical Journal Editors (ICMJE), lists criteria for authorship: an individual must meet the four criteria to be considered an author. Authors must also be able to take public responsibility for appropriate portions of the work. To ameliorate authorship issues, some journals ask authors to self-identify their contributions, while others ask authors to fill out a checklist of contributions (covering all aspects of the research, manuscript, and funding). Authors need to understand the ICMJE authorship criteria and adhere to them, and journals need to apply consistent policies on authorship (unfortunately, many journals do not). Issues regarding the order of authors must be tackled by the authors themselves, who also must appoint a “corresponding author” to serve on behalf of all coauthors. The corresponding author is the primary correspondent with the editorial office during manuscript submission and review. If a paper has a large number of authors, it may be more appropriate to list many of the individuals as collaborators instead of authors; the names of collaborators are still displayed in PubMed. In cases where there are hundreds of authors, it is ideal to create a group author name for the byline. Moreover, individuals who have made substantial contributions (but who do not qualify as authors) should be listed in the acknowledgment section. However, editors must obtain permission from all people named in the acknowledgment section before listing them. Conflicts of interest occur “when an author, reviewer, or editor allows a self-interest to influence judgment,” and these should also be disclosed in acknowledgment sections. The interest may not necessarily result in biased judgment and it may stem from a variety of areas: financial, professional, academic, ethical, political, or personal. It is better to declare a potential conflict outright than have the information uncovered after publication. Studies have shown industry sponsorship and financial relationships are associated with conflicts of interest and biased conclusions; although, despite the prevalence, authors are often in denial or confusion about which financial disclosures are relevant. Most journals require the author to disclose all financial interests surrounding the manuscript subject matter (for the past three years or the time period involving the work). Flanagin demonstrated how to fill out an ICMJE conflict of interest disclosure form, which automatically compiles a disclosure statement for authors. She also cited Openpayments.com as a means to view physicians’ funding reports—it shows everything from paid meals to research grants. Flanagin also discussed copyright and publication licensing, including these aspects of copyright law: what it is, who owns it, how long it is in effect, and the Berne Convention. Flanagin advised caution when dealing with works that are presumed to be in the public domain because there are occasional exceptions. She referred to the AMA Manual of Style and CSE’s Scientific Style and Format for more information on copyright basics. Copyright transfer is used by some journals when publishing manuscripts; it enables journals to lawfully publish the work and own all copyrights to it. Some journals use a publication license, which is an exclusive license granted to the journal for the publication of a work, where the ownership of the work remains with the author. Some works may not be protected by copyright (typically titles or shorter phrases) but may instead be covered by a patent or trademark. For federal government employees, their work is automatically in the public domain and is not protected by copyright law. The Creative Commons (CC; creativecommons.org), which aims to promote shared knowledge, gives authors access to free copyright licenses and allows them to decide on the conditions of the copyright. Flanagin described the principle of fair use as one “that permits limited use of copyrighted material without acquiring permission from the rights holders.” There are four factors that determine whether a situation establishes fair use: 1) the purpose of use, 2) the nature of the copyrighted work, 3) the portion of the work used, and 4) the effect of use on the market value of the copyrighted work. For works governed by traditional copyright (e.g., not CC licenses), there are not actually specific numbers or guidelines on the amount of text that may be used; however, the length should never diminish the potential value of the original work. Republishing an entire table may be a copyright infringement; sometimes using a few lines from a table is acceptable, provided proper credit is given. Editors and authors alike must be careful to avoid plagiarism. (There are several online plagiarism checkers: Turnitin.com, Crossref Similarity Check, and Quetext.com.) It is essential always to follow journal policies, get appropriate permissions, and use proper citations. On the topic of permissions, Flanagin differentiated the two types: 1) permission for reproduction or adaptation of material and 2) permission to publish identifiable information about a patient (e.g., written descriptions, photos, or genetic pedigrees). On the issue of patient privacy, it is necessary to get written informed consent from the identifiable patient prior to publishing the information. Also, it is best to omit identifying details from the text unless they are essential to the research implications. Furthermore, patient information should never be altered or falsified. An ethical–legal breakout session was held following the presentation to discuss common ethical dilemmas. In small groups, participants discussed an example of an authorship issue and a conflict of interest. They then presented their conclusions in front of all the course attendees. Some groups opted to handle situations differently, but primarily there was agreement about how to proceed in these scenarios. For the third section of the short course, Stacy Christiansen discussed abstracts, including how to edit and perform quality control checks on them. An abstract acts as summary for an entire paper and describes the who, what, where, when, why, and how of a study. Secondary to an article’s title, the abstract is one of the first features readers will see, and it helps them decide whether to read the rest of the article. Most scientific abstracts are freely and publicly available, and they are searchable on websites such as PubMed or Google Scholar. The National Information Standards Organization (NISO) specifies every journal article should include an abstract. Christiansen also discussed structured abstracts, which first appeared in the mid-1980s. 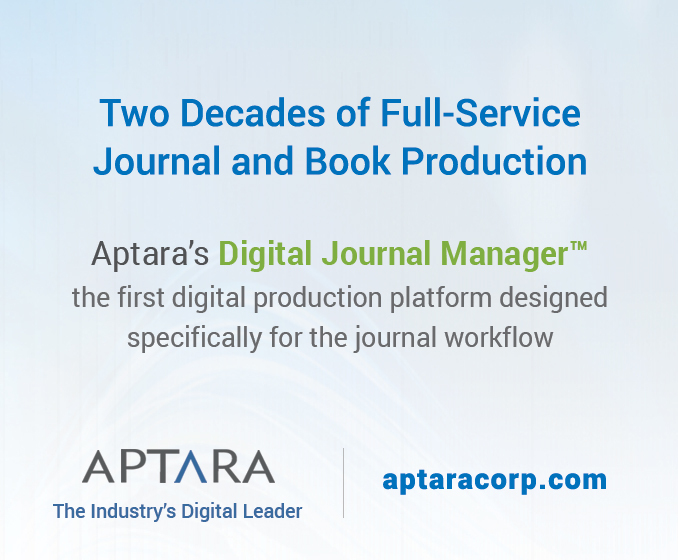 Today, a majority of medical and scientific journals require some form of structured abstract (with 3–10 headings). There are some journals that publish unstructured abstracts, in the form of a narrative paragraph; the content often depends on the audience of the article and scope of the study. It also is not unheard of to find a table in the abstract, which JAMA terms “tabstract”; these can be helpful in cases of data-dense paragraphs, but they do not display properly in HTML or PubMed. Christiansen also offered examples of graphic and video abstracts—two relatively new abstract formats—and discussed the idea that these may be more user-friendly to the general public; nonetheless, Christiansen also counseled these formats need to be used in conjunction with a traditional written abstract. Most importantly, abstracts serve as a synopsis for all aspects of the study, including the outcome. Christiansen provided the mnemonic CCAT (clarity, consistency, accuracy, and thoroughness) to remember while editing abstracts. On the issue of clarity, she cautioned attendees to be aware of the possible overuse of punctuation (JAMA does not require complete sentences in its abstract prototype). For consistency, groups and comparisons must always appear in the same order and with the same name. Furthermore, abbreviations and nomenclature should be used consistently throughout. Regarding accuracy, it is important to look for data beyond p values or relative differences; the abstract must also include absolute numbers and percentages. It is vital to check results that appear in the abstract against the results in the rest of the paper. Additionally, all data presented in the abstract must also appear in the text or tables, though it is acceptable to round values in the abstract, as long as accuracy is not hindered (sometimes space constraints necessitate this practice). To ensure thoroughness, all information in the abstract must also be found in the rest of the paper; to this end, the important components (who, what, where, when, why, and how) of the paper should appear in the abstract. Finally, references, tables, and figures should not be cited in the abstract. For the final lecture, Peter J. Olson discussed some best practices for editing in the STM fields. The main topics he reviewed were abbreviations, ambiguity, consistency, redundancy, word usage, and verb tense—all of which are essential to comprehensive copyediting. Editors must take care with abbreviations and ensure they are used practically. If it is only used once in the document, then perhaps the abbreviation is not needed. Also, it is typically a good idea to use the abbreviation at each instance of the term after it has first been introduced. 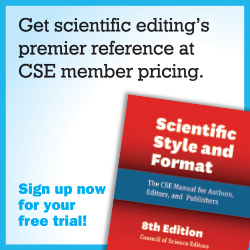 It’s best to avoid using the same abbreviation for different terms in the same document (e.g., CSF for colony-stimulating factor and cerebrospinal fluid). Some abbreviations may require the use of lowercase letters (e.g., mRNA, CoA, and kDa), and gene names are particularly difficult to abbreviate (the rules vary with the species). For plural abbreviations, a lowercase “s” should be added to the end, with the exception of units of measure and inherently plural terms (e.g., National Institutes of Health). On the topic of ambiguous text, Olson recommended looking at clues in the rest of the text to decipher the intended meaning and querying the author in cases of uncertainty. He presented numerous real-life examples of manuscript ambiguity and their practical solutions. With regard to consistency, editors must confirm data are formatted and presented similarly so parallel comparisons can easily be made. Editors should also verify whether numbers and percentages add up or match their counterparts. However, Olson advised editors to always consider the context of the information prior to issuing an author query concerning an incorrect total; for example, there are cases where the percentages do not need to add up to 100 percent (i.e., they do not represent a total). It is also the duty of an editor to reduce redundancy in manuscripts, thereby making the paper easier to read. When removing words, it is imperative not to change the meaning of the statement—this goes for other aspects of manuscript editing as well. Olson also provided several examples of redundancy, including sentence wordiness (solve this with restructuring) and word duplication (e.g., MRI imaging—“imaging” is duplicated). Olson discussed proper word usage and included several more examples to illustrate the main principles: it is best to avoid jargon and aim for clarity. Also, editors should help authors avoid unnecessary adjectives such as “nice” or “exemplary” and keep terminology simple (e.g., use “address” instead of “tackle”). To conclude, Olson also incorporated a segment on verb tense, including present, past, present perfect, and future, and he described and demonstrated general rules for when to use each tense. For many of the examples throughout his presentation, Olson first queried the course participants to see what they thought the problems were with the example before he explained the solution; this was an excellent way to actively involve the course participants. Olson’s presentation was followed by small-group roundtable discussions of how to handle difficult situations a manuscript editor may face. These scenarios centered on what to do when an author has a particular question, concern, or problem. Through group discussion, the course participants learned a great deal about how different journals and editors manage these issues.